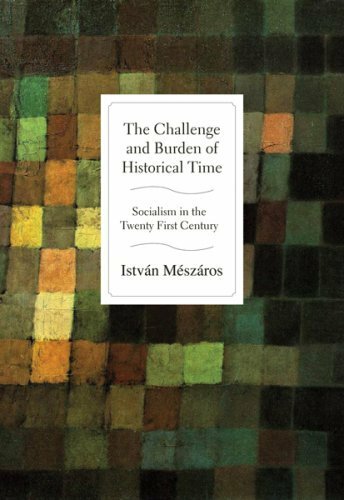 An extraordinary new work by the leading Marxian philosopher of the late twentieth and early twenty-first century, The Challenge and Burden of Historical Time represents a breakthrough in the development of socialist thought. It can be seen both as a companion volume to his earlier pathbreaking Beyond Capital and a major theoretical contribution in its own right. Its focus is on the âdecapitation of historical timeâ in todayâs capitalism and the necessity of a new âsocialist time accountancyâ as a revolutionary response to the debilitating present. Extending MÃ©szÃ¡rosâs earlier analysis of capitalism as a social-metabolic system caught in an irreversible structural crisis, it represents a crushing refutation of the view that âthere is no alternativeâ to the current social order. MÃ©szÃ¡rosâs wide-ranging analysis explores the forces behind the expansion of world inequality, the return of imperial interventionism, the growing structural crisis of the capitalist state, and the widening planetary ecological crisisÂalong with the new hope offered by the reemergence of concrete socialist alternatives. At the heart of his book is an examination of the preconditions of Latin Americaâs historic Bolivarian journey, which is producing new revolutionary transformations in Venezuela, Bolivia and elsewhere. The Challenge and Burden of Historical Time is a work of great political as well as philosophical importance, one that defines the challenges and burdens facing all those who are committed to a more rational, more egalitarian future. About: An extraordinary new work by the leading Marxian philosopher of the late twentieth and early twenty-first century, The Challenge and Burden of Historical Time represents a breakthrough in the development of socialist thought.